Cordoba is a mid-sized city in Andalucia Spain. It's a popular tourist destination because it is an ancient city that has a rich culture, an impressive Old Town, and a fascinating art scene. In the most historic part of the city you'll find a network of quaint streets and alleys that weave their way through nice squares and interesting buildings. At the center of the city is the Mezquita, which reflects the city's importance in the Islamic world during medieval times. As a popular tourist destination, Cordoba has many different hostels and hotels. There are a range of hostels available for budget travelers. Some offer a social setting where it's easy to meet other guests, while others feel a bit more like a hotel. 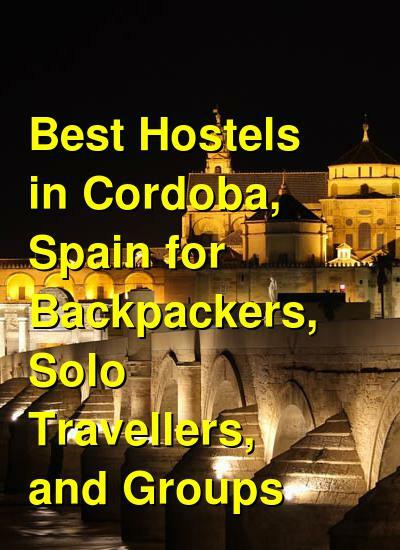 How much do hostels in Cordoba cost? A good hostel for solo travellers, small groups, backpackers, and female travellers. Cordoba Bed and Be is a favorite hostel for backpackers in Cordoba, Spain. It's located on the city's main commercial street, Jose Cruz Conde, and is in the middle of the city. It's a clean and modern place to stay that has a lot of amenities available for guests. There are bicycles for rent, wi-fi throughout, laundry facilities, a shared kitchen, and modern and clean bathrooms. The hostel also hosts a number of events for guests. There are regular walking tours of the city, tapas nights, sushi dinners, and barbecues. This is one of the best places to stay in town if you want to meet other travelers. The hostel is both social and charming. It has ten rooms that range in size and include twin private rooms as well as four and eight bed dorms. If you're staying in a dorm, you have access to a security locker. There's also a lounge with a large television, sofas, and comfortable chairs. If you want to be in the center of everything then this is the place to stay. It's one of the most popular hostels in town and is perfect if you want to meet other fun travelers. May Flowers Hostel is located in the historic heart of Cordoba in a Andalusian house. It's about a five minute walk from the Mezquita and is two minutes from Alcazar of Christian Kings and Royal Mews. In the surrounding neighborhood you'll find plenty of nice squares and quaint streets. The hostel itself has a nice patio and a variety of amenities for guests including free breakfast every morning. There are double private rooms and four, five, six, or eight bed dorms. Some dorm rooms are female only. If you're looking for a peaceful and relaxing place to stay with friendly staff and a mellow setting, then this is a great option. It's central location and intimate vibe make it a nice place to spend a few days. Hostal La Fuente is another popular place to stay in Cordoba, Spain. It's located on San Fernando Street and is about five minutes from the Mezquita-Cathedral. This is more of a hotel than a hostel, but it has two large lounges where guests can hang out. These rooms are also available for business meetings or other events. The hotel also has an on-site restaurant that serves decent food, and a traditional Andalusian patio where you can enjoy the mild climate. If you've arrived with your own vehicle, there's also parking available. There are forty rooms in total and every room has air conditioning, heating, a television, a minibar, a safe, and its own full private bathroom. There are single, twin, triple, and quad rooms available. The rooms are a bit small but they are relatively comfortable and the location and price of the hotel are great. Backpackers Al-Katre is another convenient and affordable hostel in Cordoba. It's located about 100 meters from the mosque and is surrounded by many quaint streets and interesting architecture. The area is perfect for walking so it's fun to just wander out the door and explore. There are also many great restaurants and tapas bars in the surrounding area. The hostel has some nice common space including two patios where guests can relax outside. There's also a shared kitchen and breakfast is available every morning. There are twin private rooms a well as four and six bed dorms. Female only dorm rooms are available. The staff here are great and can answer any questions that you might have. They offer good suggestions for restaurants and can help you arrange any transportation that you might need. This is a friendly and relaxing place to stay if you're traveling on a budget but don't want to sacrifice quality.